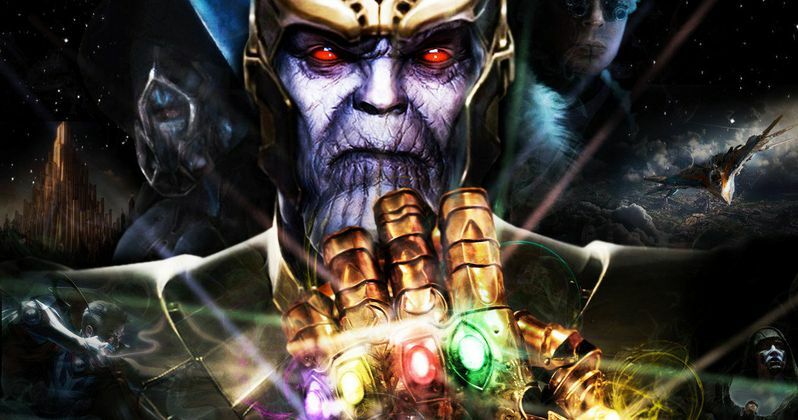 We got our first brief glimpse of the Mad Titan known as Thanos at the very end of Marvel's The Avengers, but the character truly took shape in last year's Guardians of the Galaxy, portrayed by Josh Brolin. We also saw him briefly at the end of Avengers: Age of Ultron this summer. We'll surely be seeing him again in the near future, as Marvel prepares to launch Phase Three with next year's Captain America: Civil War, which ends with Avengers: Infinity War Part I and Avengers: Infinity War - Part II. While doing press for his thriller Everest, in theaters September 18, Josh Brolin revealed he isn't sure what superhero movie he'll turn up in next. Here's what he had to say, when asked if he'll show up in Captain America: Civil War. "I don't know which one I'm in. That's a Kevin Feige question. I know the trajectory of what they're doing, but I don't know exactly which one I'm in." Since Captain America: Civil War wrapped production earlier this month, and we never heard about Thanos' presence in the story, it seems unlikely he will pop up in this first Phase Three movie. However, it's possible that he could be brought in for reshoots. We're not sure what Marvel's plans for Thanos may be at this time. The actor also spoke about doing research at comic book stores, and connecting with die-hard fans. "I love going into a comic book store and a guy connecting me with Thanos, and seeing the incredible regressive awe that happens. Like you see them lose 30 years in can't-breathe awe. That's fun, and I have a lot of respect for those fans. I'm excited about doing it, I really am." Avengers: Age of Ultron helped set up Avengers: Infinity War Part I and Avengers: Infinity War - Part II, when Thor (Chris Hemsworth) first learned of the Infinity Stones, after he was put under a mystical spell by Scarlet Witch (Elizabeth Olsen). During the end credit sequence, Thanos shows up with the Infinity Gauntlet, stating "Fine. I'll do it myself," meaning he will start trying to collect the Inifnity Stones himself. As of now, there is very little we know about Avengers: Infinity War Part I and Avengers: Infinity War - Part II, but Josh Brolin revealed he's looking forward to taking on all of Earth's Mightiest Heroes. Are you looking forward to seeing what Thanos will do in the two-part Avengers: Infinity War? We still have several years before these films hit theaters, with Avengers: Infinity War Part I arriving May 4, 2018 and Avengers: Infinity War - Part II arriving May 3, 2019. Production on both movies is said to last nine months, with shooting scheduled to begin in late 2016. Stay tuned for more updates on Avengers: Infinity War Part I and Avengers: Infinity War - Part II.